Does Design Thinking Have a Pedagogy Problem? This was the question posed by Julie Schell (@julieschell), a leading expert in learning design and innovation in higher education, during her Future 20 Session at SXSWedu. Julie posed the question to a packed room of educators, many of whom are design thinking enthusiasts and shared not only the problem she sees but also a few solutions. Here’s a recap of the session with my take-a-ways. 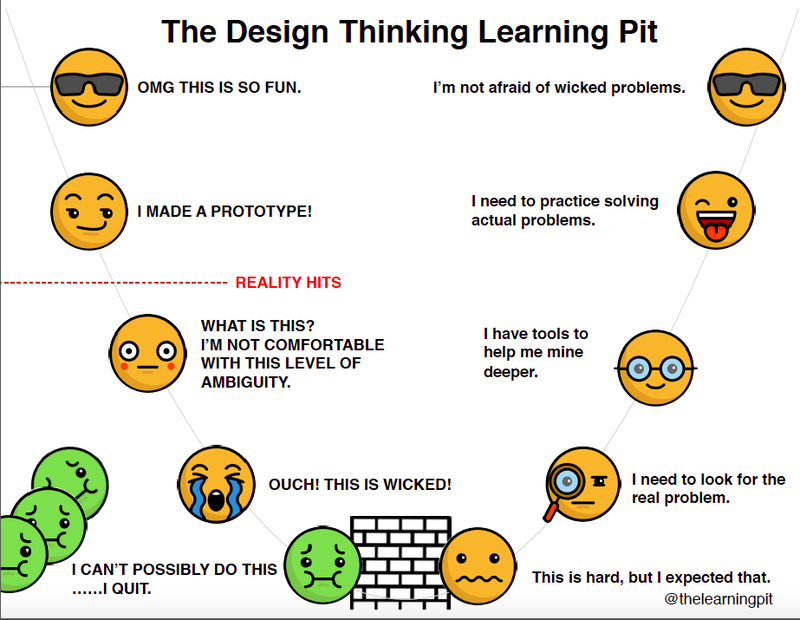 The popularity of design thinking is contributing to the pedagogy problem. With so many people eager to dive into design thinking, the number of design thinking boot camps, toolkits, and free resources are on the rise. This is the pedagogy problem that no one is talking about—rapid exposure and the way we are teaching it. With such limited exposure, people are not developing an expertise in design thinking but have illusions of familiarity. As a result, are we sending out novice design thinkers who are ill-prepared to tackle our wickedest problems? lack of sustained engagements to provide course correction. I don’t disagree with Julie and I see value in the proposed solutions, however, I also see value in continuing to expose people to design thinking at a rapid pace. While some may attend a two-day boot camp and consider themselves a design thinking expert, I don’t think that is the norm. In fact, most of the leaders I have met who are experiencing success using design thinking have committed deeply to learning more about design thinking and developing their expertise. There is great value in learning by doing. Perhaps another solution to consider is the reframing of how we are teaching design thinking. Rather than aspire to turn out more design thinkers, what if we aspired to teach the habits and mindsets of a designer? You don’t need to be an expert to start thinking differently and therefore leading differently.